One subject that almost every English student hates is Shakespeare. As a result, there is much to his great body of work that we don’t tend to discover. 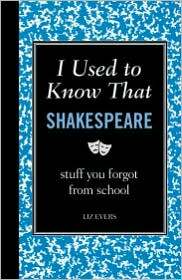 Liz Evers book I Used to Know That: Shakespeare helps bring in a compact manner all those things we forgot, or things we didn’t know. As usual, I love this blackboard series of books. Each one presents a mini education. There was so much I didn’t know came from Shakespeare, and so many interesting plots that I intend to actually start reading more of it. I’ve read Macbeth, Hamlet, and Romeo and Juliet, but that’s about as far as I ever went. The book is divided into his major plays, there are characters lists, quotes and misquotes, words he introduced into our language, and many other areas. Like all the others, I’d recommend this either as a gift for someone just starting into High School english to help them understand, or for those Shakespeare/Literature fans. It brings a subject that some avoid out, and makes it interesting. Liz Evers is a writer with a background in communications. Her love affair with Shakespeare began when she first studied Hamlet in secondary school in her native Dublin and continued at university, where she steadily ploughed her way through the Bard’s complete works as part of her degree in English Literature. She also has an MA in Film and a Diploma in Journalism. She now lives in London, within dashing distance of the Globe Theatre.